Just 10 days before Christmas last year, a local family lost their Britannia Road home and its contents to a fire. The 100-year-old structure wasn’t yet insured according to family friend, Barry Groomes—the owners first needed to complete some work in order to satisfy insurance regulations. They were in the process of doing that, but it didn’t happen soon enough. Fortunately, no one was injured in the fire, but their home was a total loss with damage estimated at $350,000. Now they need to rebuild, and Groomes wanted to do something to help out. About three weeks ago, he had the idea to organize a fishing derby with 100 per cent of the entry fees going to the family—whatever they managed to raise would be money the family didn’t have before, reasoned Groomes. So Groomes, along with friends Ron Earl, John McAuley, Andy Todd, and Tammie Lupton (homeowner Bob Lupton’s sister—some will know him as Butcher Bob from Metro), began putting plans in place for the derby and gathering donations from local businesses for prizes. They decided to host the derby at Hutcheson Beach on Lake Vernon on Saturday, February 16 during Family Day weekend. The Ontario government has declared Family Day weekend a free fishing event across the province, so anglers don’t need a licence to participate in the derby. There will also be people on hand with power augers to drill holes in the ice if participants don’t have one of their own. The ice is more than 20-inches thick right now, says Groomes, and the fishing has been good. 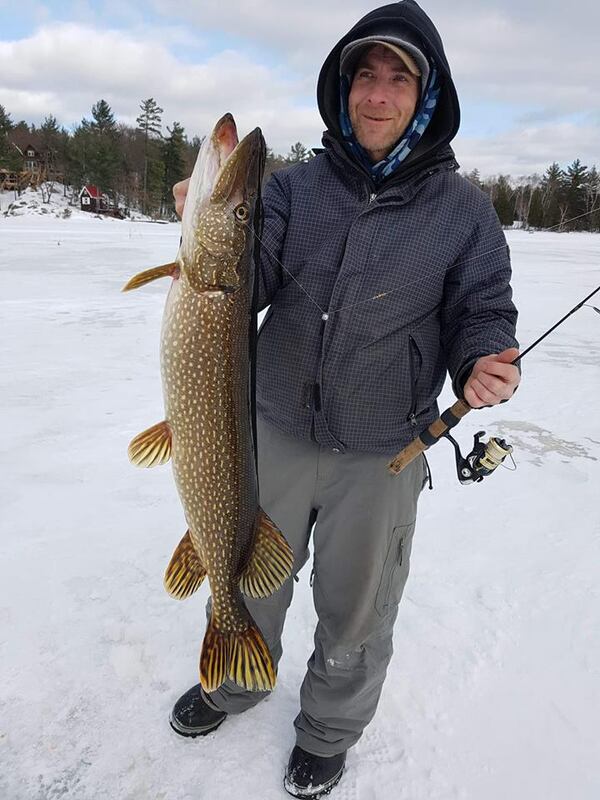 Just last weekend, a huge pike was pulled from the lake. The derby runs from 9 a.m. to 3 p.m. on Saturday, February 16. Participants must sign a waiver and adhere to the derby rules, which are available on the event Facebook page and will be posted at the event, as well as Ontario fishing regulations. Live bait is permitted, as are portable fishing huts. Prizes will be awarded based on the length of fish caught, as measured by judges immediately, with one point awarded per inch. Entry fee is $50 per person. One child under 12 can accompany an adult for free. So far, organizers have gathered more than $1,000 worth of prizes from local businesses that will be distributed on derby day. The top three anglers will also receive a combined total of $500 in cash prizes. There may also be other fundraising activities at the derby, like a BBQ with proceeds going to the family. And Groomes is already thinking ahead to future years—he hopes they’ll be able to make the derby an annual event with proceeds benefiting a different local charity each year. To register for the derby, email [email protected] with your name, cell phone number and email address, and then send a $50 e-transfer to the same address using derby as the password. Or you can show up at Hutcheson Beach on February 16 after 7 a.m. to register in person. For more information, visit the Lake Vernon Fishing Derby page on Facebook.